It has been an incredible month for all of us at Chemo Duck. Gabe’s mom, Lu, is from Yorkshire in Great Britain and this past month, Gabe was able to fly overseas to meet his English relatives. But this wasn’t just a normal visit —Gabe was going overseas to see some very important people and places that remain near and dear to Chemo Duck and its mission. The first stop on their trip? A visit with the Phillips family. Lu and Andrew Phillips have been working together closely for years. Andrew’s son, Harry, just finished his own cancer treatment journey and Andrew had originally reached out to Chemo Duck for support. What began as a simple request for help has transformed into a lifelong friendship. Not only that, Andrew was so impressed with Chemo Duck that he decided to help store and share Chemo Ducks within the U.K. 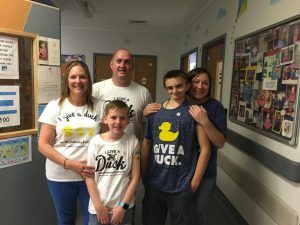 This venture became so popular that Andrew decided to created the ‘Give a Duck U.K.’ program, which helps raise funds to deliver Chemo Ducks to children in the U.K.
After a quick catch-up session, Gabe and the Phillips family then made their way over to Leeds Children’s Hospital, which has embraced Chemo Duck as a teaching tool. 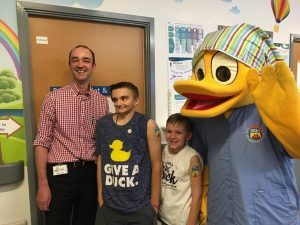 This was the first hospital in the U.K. to introduce Chemo Ducks onto the wards and these were generously funded and imported by Candlelighters, Yorkshire’s children’s cancer charity. Candlelighters have worked with the Phillips family for several years. Originally the family stepped in to simplify the shipping process. This was promptly followed up with a huge fundraising campaign to fund the Candlelighters program, which has raised almost £100,000 so far for the charity. Gabe visited the Clarendon Wing and met with children who are currently undergoing cancer treatment and whose lives have been touched by Chemo Duck. For example, the Leeds team has even introduced specially made outfits for their Chemo Ducks, which are handmade by a volunteer group at the Rivers Meet Café, and children can choose a new one every month. The hospital also happened to be where Gabe’s Gran received her cancer treatment, and his aunt is currently being treated, so this visit was very meaningful on several levels! Seeing how readily hospitals in the U.K. are embracing Chemo Duck has inspired Gabe, Lu and the rest of the Chemo Duck team to bring some of these ideas back to hospitals in the U.S.
Watch an overview of Gabe’s trip to the U.K.